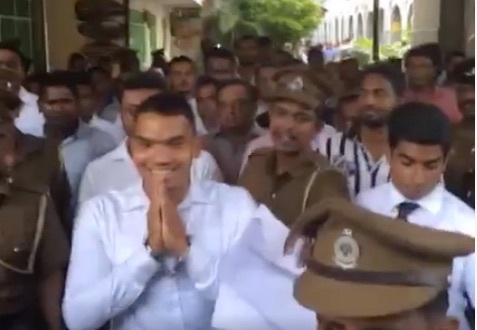 Parliamentarian Namal Rajapaksa was ordered to be remanded till August 22 by the Colombo Magistrate Courts over money laundering charges. Rajapaksa was arrested this morning by the Financial Crimes Investigation Division (FCID) over money laundering charges in connection to HelloCorp shares bought by him and several others worth Rs. 125 million. Rajapaksa, who is the eldest son of former President Mahinda Rajapaksa was arrested when he arrived at the FCID to give a statement in connection to the HelloCorp case. Sudarshana Ganegoda who was arrested along with Rajapaksa was also remanded till the 22nd. Gammanpila added that several investigation units including the CID, FCID and the Bribery Commission were like factories that are producing various charges. “Unlike in other cases, until we go to courts we don’t even know what the charges against us are. Even when you are suspect of murder, there is a process, and the police first informs you of the charges, but for us we know about the charges only at the courts,” he added. Last year, JVP Provincial Councilor Wasantha Samarasinghe lodged a complaint claiming that Gowers Corporate Services Pvt Ltd headed by Namal Rajapaksa had purchased shares from HelloCorp. However, the money that was used to purchase the shares by Rajapaksa and several others could not be legally accounted for, and the FCID in their investigation came to the conclusion that the money was earned in an illegal manner. This is the second Rajapaksa son who has been charged with money laundering. Yoshitha, the former President’s second son is also currently out on bail on money laundering charges over a case involving the Carlton Sports Network.